It is no secret that the list of recipes I want to try is an endless thing, but sometimes because of the large amount of recipes it is hard to choose just one (or two). I usually use the contents of the fridge and cupboard as a guide, but sometimes not even that is enough – I just need something more specific. 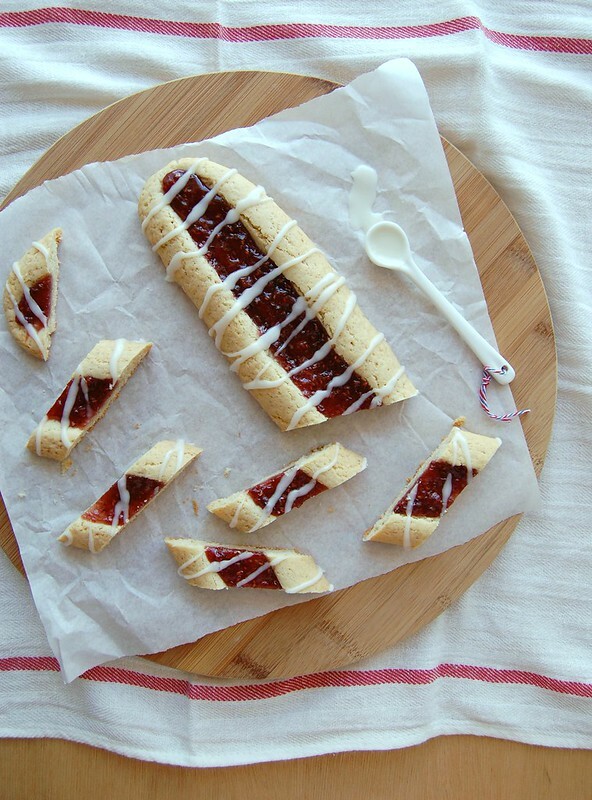 These are delicious and dead easy to make; too bad I didn’t have apricot jam around – I am sure the cookies would taste amazing with it, too. Cookies: whisk together flour, baking powder, salt, and cinnamon. In a food processor, pulse almond paste and sugar until smooth. Add butter, eggs and vanilla and blend until smooth. Add flour mixture and pulse until dough forms (here I added 30g of flour because my dough was much too soft). Divide into 4 equal pieces, wrap in plastic, and chill 30 minutes. Preheat oven to 180°C/350°F. Line two large baking sheets with baking paper. On a lightly floured surface roll each piece into a 25cm (10in) log. Transfer logs to prepared sheets 10cm (4in) apart, then flatten to about 5cm (2in) across. Bake until just dry, 12-15 minutes. Remove from oven; with the handle of a wooden spoon, make a trench down each log. Spread 2 tablespoons jam into each trench. Bake until golden brown, 8-10 minutes more. Let cool on sheets on wire racks. Whisk together confectioners' sugar and milk until smooth. Drizzle glaze over logs. Let glaze harden, 20 minutes. With a serrated knife, cut logs on the diagonal into 2.5cm (1in) slices (cut the cookies using the knife like a guillotine - don't use a sewing motion). These are very cute and sound tasty to boot. Ideal with a cup of tea on a lazy afternoon. i love jam cookies. they look great! Beautiful cookies, I love the almond paste and jam filling!